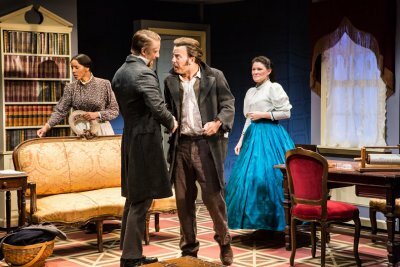 The Civil War era play, Couriers and Contrabands, is billed as “A New Spy Thriller” and it’s a frustrating experience. The tedious first act is a solid hour of flavorful Southern dialogue and exposition about its seven characters and The Civil War without the semblance of a plot. The last few minutes are energized when it is revealed that two of the characters are actually Union spies. The second act is filled with action, suspense, conflict, plot twists, and passionate debate. Set in May of 1864 in Petersburg, Virginia, we meet the widowed and fiery Thomas Montgomery who is a Confederate operative. 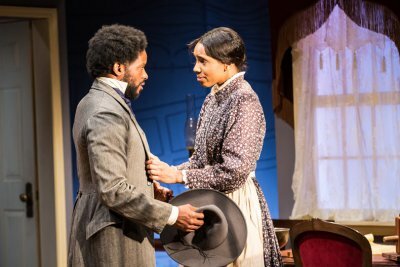 He lives with his morose widowed sister Lottie Saunders and her dutiful African-American housemaid slave Nancy. Frequent visitors to their home include Thomas’ gruff friend and colleague James Hanson and the steely Confederate Army Corporal George Dunhaven. Amiable next-door neighbor Mary Gardner is good-friends with Lottie and also often visits and her stalwart African-American slave servant Willie shows up from time to time as well. The prologue begins in darkness. The sound of a tremendous storm is heard and an African-American man in period clothing roams through the audience with a lantern as the sound magnifies and strobe light effects occur and then a blackout. This atmospheric but not especially essential vignette is followed by the lights up on the Montgomery’s drawing room. Thomas is at his desk writing with a quill pen. His sister sits on a sofa doing needlepoint. Corporal Dunhaven paces around the area. “This continues for quite awhile,” according to the script. This silent tableau goes on for what feels like an eternity before the actors start speaking. Apart from an attempt at an aesthetic stage tableau there is no discernable reason for this digression. Playwright Victor Lesniewski has a facility for dialogue and that is finely integrated with well researched historical details. In the second act, he demonstrates a great command of structure that is so missing from the first. Director Kareem Fahmy is also ambiguously credited as “Co-Developer.” Mr. Fahmy’s staging is purposeful when it grapples with the problematic first act and does achieve very fine work from the cast. In the second act, his direction of the action sequences are lively and the pace thankfully quickens. 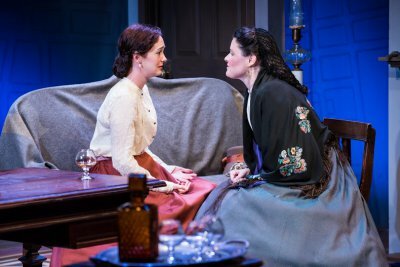 Scene transitions between the Montgomery house and Miss Gardner’s house are swiftly and cleverly executed. The actors all give solid and believable characterizations in these period roles. That is most evident during the leaden first act when they earnestly solider on doing their best to arouse the audience’s waning interest. Michael Schantz has the bearing and vocal command of an experienced classical actor and is excellent as Thomas Montgomery. He authoritatively delivers numerous speeches as well as giving a richly realized performance. In the complex part of Mary Gardner, Helen Cespedes winningly conveys the character’s conflicts with the necessary and rapid shifts of emotion. Ms. Cespedes’ tremendous charm and talent is a vital asset to the production. With a colorful everyman quality and presence reminiscent of Warren Oates and John C. Reilly and with a Tom Waits style delivery, the dynamic Eric T. Miller forcefully plays the blunt James Hanson. The engaging Jeremy Beck makes the mousey Corporal Dunhaven likeable with his personable traits. Heather Hollingsworth warmly bridges Lottie Saunders’ harshness and fragility with her subtle yet vibrant stage presence. Luke Forbes is compelling and quite touching as Willie. Krystel Lucas poignantly and very skillfully offers a vivid portrait of a house slave of that time with her simple but effective performance. Scenic designer David Elser’s visually appealing and resourceful work is a high point of the production. It includes a triangular thrust set-up for the Montgomery drawing room that switches to a conventional room for the Gardner house. There are also creative indications of stairways and hallways and the set is dressed with evocative furnishings. Colorful hoop skirts, gray uniforms, and expertly tailored frock coats are the hallmarks of Sarafina Bush’s seemingly lavish and wonderful costumes that are a great part of the show’s successful qualities. The lighting design by Nicholas Houfek and the sound design by Mark Van Hare are both accomplished and enhance the technical intentions of the author and director. Couriers and Contrabands in the end does succeed as spy thriller but it takes way too long to get there. Eye-opening, mysterious, and emotional, one family's deepest secrets rise to the surface as they embark on a journey through a (literally) cluttered past.